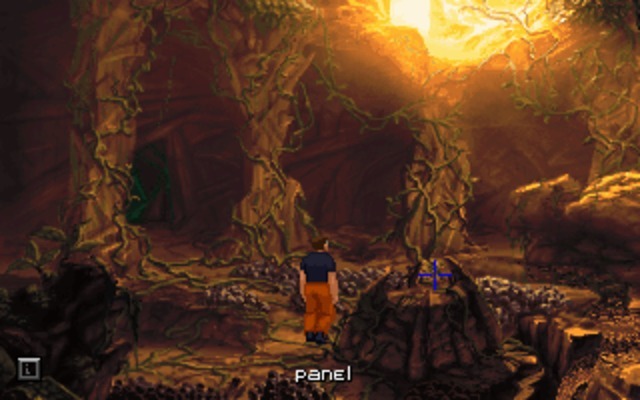 I should first admit that I’ve avoided The Dig for years, for no reason other than the oft-repeated assertion that this is the worst adventure LucasArts ever made. I never actually (forgive the pun) “dug deeper;” that little notation in the social consciousness was enough to repeatedly turn me away. Even later reviews stating some variant of “It’s bad, but a bad game for LucasArts is a good game by most other standards” gave no comfort. I suppose I wasn’t comfortable with the idea of seeing LucasArts in anything but top form. I’m happy to report that The Dig really isn’t that bad. The Dig begins with the eerily familiar premise of an asteroid hurtling toward Earth, and a crew of astronauts tasked with using explosives to deflect its path. You play as Commander Boston Low (voiced by Robert Patrick); military trained and all-around all-American. Your other two crewmen of note are archeologist Ludger Brink (Steven Blum) and reporter Maggie Robbins (Mari Weiss). You should probably be asking why an archeologist and a reporter – who also happens to have a knack for languages – should be on this mission, or in space, at all. That question never really gets answered. Logic has been thrown out for the sake of their obvious usefulness once the mission expands… er… beyond its expected parameters. Through a completely expected unexpected twist, the three of you are transported to a distant alien planet. This is a LucasArts game, so I’m not even going to bother sexing it up by making it sound like you must work together to survive – in LA tradition, you can never, ever die. Instead, you must work to solve puzzles, of both the macro (Where are we?) and micro (How does this device work?) kind. The plot really starts to kick in when you discover an alien construction whose power seems like a miraculous find, until you realize that its consequences might be far more horrifying than you could ever have imagined. The plot and core idea is there and strong, but The Dig has a difficult time reaching “winner” status because of its frequent contradictions. The very beginning starts out weak and a little embarrassing. Radio chatter between crew members is overly loose and playful, especially considering how critical the situation is supposed to be. You’re ten minutes from the destruction of Earth, and the crew is cracking jokes. When The Big Secret is revealed, nobody seems to care. 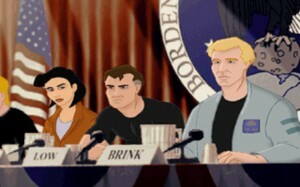 Boston simply announces “Yeah, I had secret orders in case that happened.” Likewise, once the plot gets rolling in the second half, you actually care about the three main characters, and you have to make some truly difficult decisions, the game’s design and inherent limitations soften their impact by making those choices required. You don’t really feel like you’ve had to make a “tough call” when it truly is the only call you can make, and the repercussions are quickly forgiven or forgotten. You’ll notice this throughout the entire game, and a bit of research quickly explained why – this final product is a game designed by committee. 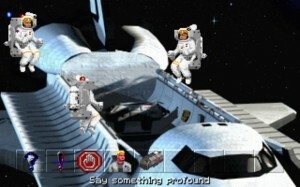 Initial work began when Steven Spielberg approached LucasArts with the idea back in 1989. Fast-forward through layoffs, four different designers, two restarts, two engines, eleventh-hour plot changes, countless redesigns based on bugs or technical limitations – and even some intervention from the legal department – and this is what you’re left with: a slightly schizophrenic amalgamation of a number of great ideas and a number of cuts based on fear from management. Whenever the game starts to ditch science for a more first-grade explanation, you can bet that someone voiced their concerns that players wouldn’t “get it.” Whenever Boston goes into his “Well, I’m just a simple country boy, but maybe I should…” mode, you can bet someone got concerned that one playtester couldn’t figure out a puzzle quickly enough. Violence and grit got replaced with jokes and comic peril. The SCUMM interface got cleaved down to “one click does it all.” The potential this game was showing arguably got kneecapped once everyone started fleeing from the risks. Yes, these three are going to save the world. It’s not just a case of being disappointed with what the game could have been versus what resulted. 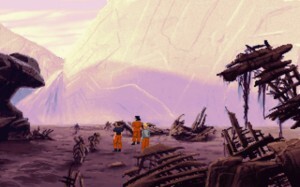 When I played through, without knowing the development backstory, what I came away with the most was the feeling that something was “wrong” with The Dig. This history explains it all. Luckily, it doesn’t mean you can’t enjoy the final product. You won’t even have to “check your brain at the door.” The game that exists here is serviceable by any adventure standards, and far more enjoyable if you’re willing to overlook the obvious flaws and get taken in by some breathtaking graphics and a story that really does start to find its way near the end. I intentionally don’t want to get too far into the happenings of the game itself, as that is best left for the player to discover. There are a few surprises, as well as the threat of surprises, that the game executes very well, and aren’t worth spoiling. In very broad terms, you’ll be using a simplified interface to solve some industry standard inventory puzzles. You’ll search around various locales, passing your cursor around the screen until it lights up to indicate something you can interact with. Find the right object (sometimes well before you’ll know how to use it), hold it in your inventory, and employ it when required. Broken items cause frequent backtracking, as you unlock a puzzle, find a new piece of the broken item, and return it for assembly. A few actual assembly puzzles, where you manipulate sections into place, and a variety of gadget-based puzzles (like aligning prisms to properly direct light) round out the group. Teamwork, disappointingly, is rare. You’ll occasionally have one or both of your teammates travel alongside you, and even have them assist you in a puzzle once or twice, but they will most often find ways to excuse themselves to focus on their own projects. You can keep in touch with a handy PDA (that also lets you play Lunar Lander! Bonus!) that will allow you to ask questions or show objects as if you were standing next to the character. Questions are all handled with an icon-based system of topics similar to Sam and Max, with lines of questioning dimming to indicate you’ve pursued them as far as you can this round. Stupid alien panel! I don’t even know what you’re supposed to do! Possibly the most brainteasing, and alternately fascinating, aspect of the game is trying to learn an alien culture and language. Though Maggie will handle the hardest part of this for you, you still will encounter objects, living pictograms (that morph as they tell a story), and devices that act as clues themselves. Similar to Riven, you’ll have to try and make sense of all of them if you hope to make any progress. And just like Riven, this may put you off with puzzles of similar style and difficulty. Here’s what I mean. Just like the Myst series, The Dig gives you a series of puzzles are easily solvable individually, but places you in an environment full of them. If you’re willing to poke, prod, and play, there aren’t too many loose switches on a device before you find the combination that works. But if you’re already frustrated, you’ll lose a grasp of what puzzle you truly don’t have enough information to solve yet, and what puzzle you’re just missing the hidden switch for. If you’re not making quick progress, then you’re more likely to give the third of a string of alien whatsits the once-over, throw up your hands at the lack of obvious clues, and go looking for the walkthrough. As an example, I encountered a puzzle where all you had to do to solve it was to hold the switch instead of clicking it. I clicked each of the three settings, even heard the change in tone when it was on the correct one, but didn’t investigate further because, frankly, I was tired, didn’t care all that much, and had already made the decision that the device needed a powerpack I was carrying but couldn’t find a way to insert. I had become too frustrated to pay attention. That’s what you’ll be faced with. If you’re willing to let this game percolate for weeks, maybe even months, with some rest and thought time for each puzzle, you’ll probably have no complaints. If you want to blast through this in a day, or a couple hours on the weekend, then maybe that walkthrough is a better choice. Otherwise, your frustration will quickly ruin a game that doesn’t deserve ruining. No one can claim The Dig doesn’t have some lovely artwork. If you’re still with us, we’ve established that The Dig has a strong concept that’s been palpably diluted, a series of tough choices marginalized by a linear structure, and some clever puzzles that may have to bake in your mind for longer than you’d like. What we haven’t touched on is the thing that will keep you playing – the stellar presentation. A combination of Don Bluth-style cutscenes, ILM renders, gorgeous painted backgrounds, and a score powerful enough to have its own soundtrack CD release, make for one of the prettiest adventures ever made. The distant world manages to have a style all its own, and the majestic views of landscapes familiar, yet alien, manage to capture that sense of adventure that draws people to investigate the stars, or at the very least, draws them to science-fiction. It’s a plate full of fantasy, so don’t expect too much day-to-day drudgery of a realistic future. Do expect to see majestic vistas, multicolored skies, beautiful lights, and some creative character designs. The soundtrack is orchestral and enjoyable. It fits the mood and sense of wonderment nicely. Some nice ambient loops, especially the whistling of air through caves or across barren plains, also help sell the feeling of loneliness without delving into despair. Voice acting all around is pretty top-notch, aside from a few moments of “outlandish German accent” from Brink. The real weakness is the lines themselves, which are rarely intense, challenging, or anything other than a laid-back battle of wits between the three. I suspect both the ever-present comedy and the avoidance of anything overly scientific or technical was another management “request.” This didn’t have to be as campy as it comes off, and moments at the end give you a better idea of how the entire game could have been. All considered, what you’ve heard is true. This is LucasArts’ worst adventure, only because too many cooks assaulted the pot. The seven years it took to flip Spielberg’s concept into a finished game did not result in a finely-polished jewel, and as is so often the case in the games industry, the product that took the longest feels the most rushed. That’s not to say adventure fans won’t find something here to enjoy. Stunning backdrops and lovely sound are both still impressive today, and the story tries not to let you down once it actually gets to the point. If you can overlook the flaws and fill in the obvious holes, you’ll unearth an above-average adventure that, while not a must-play, still solidly entertains. Fantastic artwork, CG animation, music, and sound. Meaningful story toward the end, with some good morality questions. Decent adventure, mix of typical and creative puzzle challenges. Lost its mojo across the years, delays, and multiple teams. Management apparently though it should be “funny” just like the previous LucasArts hits. Any one of the scrapped designs could have been better than the final.